Enhancing your quality of life. 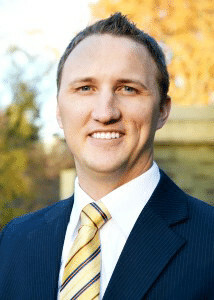 Dr. Scott Dodds was born and raised in Twin Falls, Idaho. He graduated from Brigham Young University in Provo, Utah, with a Bachelor’s degree in Business Finance, served a 2 year mission in Brazil for his church, and then went on to graduate from Logan University in St. Louis, Missouri, with a Doctorate in Chiropractic. He is married to Karissa, and they have four beautiful children, Blake, Kyson, Derek, and Kyla. Growing up, Dr. Dodds was very active in various sports and activities including baseball, basketball, football, golf, track and field, and cross country. He was introduced to the benefits of Chiropractic care because of various sports injuries. During the rehab process he recognized the value in receiving Chiropractic care for injuries and maintenance of athletes. Outside of the office, Dr. Dodds enjoys playing recreational sports, training five days a week at the local Crossfit gym, cheering on BYU sports, and above all he loves to spend quality time together with his wife and children whether it’s outdoors exploring the beautiful Magic Valley or tossing around a ball in the backyard. Dr. Dodds hopes to enhance the quality of life in each of his patients by helping alleviate their pain and discomfort and by warmly welcoming each patient into his Chiropractic family. Contact us today to get your appointment scheduled with Dr. Scott.